I’ve had beef wellington before and love it. A layer of mushrooms cover the beef and it was rolled in puff pastry. I will definitely be making this myself one day, but for this special dinner, I wanted to use pork. Pork goes great with fruit, usually apples, but I was doing an Italian menu so I decided to use figs. This was a success. Absolutely delicious. 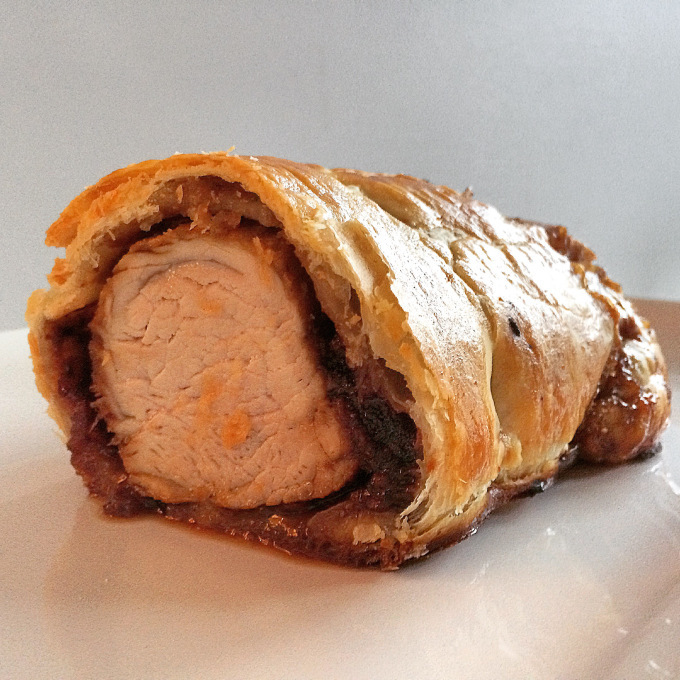 The pork was tender and moist, the fig spread was sweet, and the pastry buttery. This was a dinner that impressed. Place a large skillet over medium-high heat and add the oil. Season the tenderloin with salt and pepper. Place on the hot pan and sear until evenly dark brown on all sides, about 8 to 10 minutes. Remove to a plate and let cool. Cover with tinfoil and chill in the refrigerator for 30 minutes. Meanwhile, In a medium saucepan, add all ingredients for the fig sauce. Boil over medium-high heat until reduced to a thick paste, about 30 minutes. It seems like a lot of liquid (2 cups) but as it boils it reduces to about 1/2 cup. This is what makes the beautifully intense flavour of figs and port. Let cool for 10 minutes, remove the rosemary sprigs, and put the mixture into a blender and puree until smooth. Season the sauce to taste with additional salt and pepper if needed. Place the puff pastry sheet horizontally on a baking sheet lined with tinfoil. Make a bed of fig puree and lay the tenderloin in the center of the puff pastry. Cover the tenderloin with the remaining puree. Brush the edges of the pastry with egg wash, then roll it up around the meat. Seal the edges and tuck them under the meat. Brush all over with egg wash. Sprinkle with salt and pepper and with a fork, poke a few small holes in the top of the pastry to let the steam out. Bake for 30 minutes, until an instant-read thermometer inserted in the thickest part of the tenderloin reads 145ºF. Remove from the oven and let rest for 10 minutes. Slice into thick slices and serve. Since it is a pork loin, the portions are smaller, I served 2-3 pieces per person. I bought puff pastry sheets. Two come in package and makes your life a lot easier. They are the perfect size and you don’t have to roll them out. If you have leftovers, store them in an airtight container in the fridge. Then to reheat them, place on a baking sheet for 10 minutes at 350ºF. If you microwave it the pastry will be soggy.